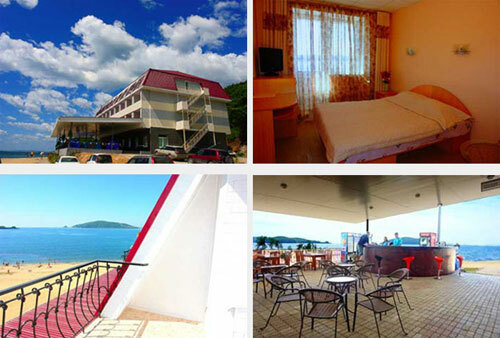 The Base is located in the very south of Primorsky Krai in a picturesque bay of Troitsa. First discoverers were wondered with these unique places. «Not otherwise than when the God was creating the planet, here He poured out everything that could collect from His pockets,» said a botanist K. Maximovich who was there in 1860. Warm and mild climate, a great number of rare species of birds, animals and plants are given by the warn Tsushima Current coming here from Korean Penensula. The only one in Russia Marine Reserve, Kedrovaya Pad reserve, Barsovy Natural Sanctuary, waterbirds protection natural park and about 20 more natural monuments. Ocean Base is eight hectares of land directly adjusting a crystal clean sea, a wide half-a-kilometer beach with plushy sand, picturesque cliffs with mushrooms-rich forests and amazing views of unique virgin nature. Our Base is one of those few where we have a real water park and all conditions for an active or just a lazy beach rest. We offer an accommodation in houses, a building or a hotel. Small two-beds wooden houses are only a stripe of clean sandy beach from the sea. There is a building with comfortable 4-beds rooms open all-year-round. Also, there is a comfortable hotel: 48 rooms with the whole range of services, a wonderful marine-cuisine restaurant, involving excursions, free saunas and warm pools, 24-hours supermarket, an easy parking lot. There is a billiards including pool and pyramid at the Base, as well as a games computer club. A water park, saunas, fresh and sea water pools are located right on the beach. Free beach chairs, umbrellas and hammocks are at your service. Active rest lovers will enjoy volleyball grounds, mini football, horse rides to picturesque places, excursions to the Marine Reserve. Motor- and row-boats, scooters and paddle boats, windsurfing, wakeboard and kitesurfing, water ski, banana boats and extremes, snorkels and flippers, and diving of course - all that is for active rest lovers. Plenty of fishes, crabs, sea urchins, scallop and sea cucumber are almost at the beach near the cliffs. Largas seal rookery (a Red Book species) is 20 minutes of sailing. The city telephone and Internet are available at the Base. Enjoy Your Rest At Ocean!